Paytm is an Indian payment gateway and an e-commerce website which enables users to buy anything from mobile recharges to bill payments and not to forget electronics and other accessories which you can find at an e-commerce website. The Unique selling proposition for Paytm is its cashback which it offers to its users when they use paytm’s platform to carry out different activities. Paytm is an all-round solution for your payments need, be it receiving a payment or paying to someone but when do so at times you might feel to transfer the money from paytm to your bank account it’s quite easy process and here’s how you can do it. Initially, the service of transferring wasn’t active but due to recent demonetization of Rs.500 and Rs.1000 has made people to rely on the cashless transaction. Sometimes you need your cash back in your bank account and for that, you can follow steps down below. First of all, you need to send SMS from your registered mobile number to activate balance transfer service on your wallet. From your registered number, Type “TMB” and send it to 53030 (Standard charges will apply) to activate the service on your the wallet. Soon you’ll receive a confirmation message. Then wait for 48 hours or max 7 days (depending on your bank account). Step 1: You’ll need a Paytm account in which your so-called cashback is stuck, a registered mobile to log in with a mobile phone or laptop in Paytm. 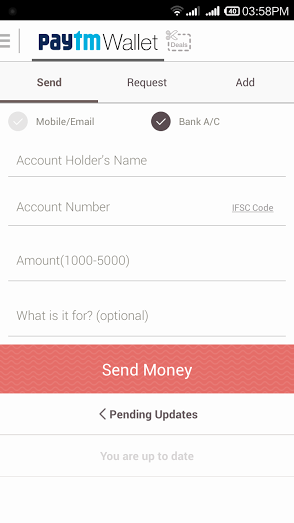 Step 2: Just Click on “Transfer Money to Bank” option as shown in the below screenshot. Step 3: Fill in the account holder name and account number with the respective amount you wish to transfer. 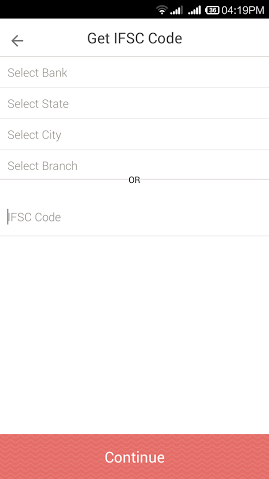 Step 4: Select the bank, state, city, and branch or if you know the IFSC code manually type in the code in there (This is very convenient) and Submit. Step 4: Click “Send Money“. Step 5: Enjoy your money back into your bank. Also, there are charges transferring wallet money to the bank account that’s around 4% for non-KYC users and around 1% for KYC verified users.